BOHEMIAN Rhapsody. Misfits. Stranger Things. American Horror Story. Crazy Rich Asians. The Crimes of Grindelwald. If you have any semblance of popular culture running through your veins, you would’ve watched at least one of these films/TV shows over the past year (although we’d forgive you for skipping the last, as it was a fantastic mess, to say the least). They’ve generated so much buzz that they shouldn’t be unfamiliar, even to the content snob who watches only the indie-est, most obscure auteur films. What made these shows so buzz-worthy, though? The one common thread was their actors, who have been an anchor for the shows even when the ratings dipped. Ahead of the awards season, here are six actors to watch as they dominate our screens next year. This shouldn’t be an unfamiliar name, but his spot in this list is well deserved after his stellar performance as Freddie Mercury in Bohemian Rhapsody. Some might have already known him from his work on the psycho-drama television series Mr. Robot, for which he won an Emmy award in 2014. But we’re looking to the future here, and particularly his portrayal of Mercury. In a rare interview with Mr Porter, Malek said that he had worked harder for his role as Freddie Mercury than he ever had for anything before. During the audition phase, he paid out of his pocket for a flight to London to get singing and piano lessons and dialect coaching. He had also watched every one of Mercury’s interviews, which prepared him for the inevitable meet with Brian May and Roger Taylor (Queen’s guitarist and drummer respectively). May called Malek’s portrayal of Mercury “uncanny” when watching his audition tapes. This massive undertaking by Malek to nail down the iconic characteristics of Mercury has paid off well. Just last week, he was nominated to be in the running to win the Golden Globe for Best Actor in a Motion Picture – Drama. If this doesn’t solidify his status as one of 2018’s breakout actors, just watch his performance in Bohemian Rhapsody. That should surely convince you. Ezra Miller at the Dior Men’s Pre-fall show in Tokyo. No celebrity in recent times has pushed the boundaries of red carpet fashion as much as Ezra Miller. With his high cheekbones and androgynous features, it’s easy for the 26-year-old star to work a gender-bending outfit with ease. During the Parisian premiere of Fantastic Beasts: The Crimes of Grindelwald, Miller stepped out in one of Pierpaolo Piccioli’s creations for Moncler Genius. The black conical puffer jacket effectively shut down the red carpet (we honestly don’t remember anything else from that event). That same puffer jacket is now sold out on Moncler’s e-store, and we don’t think that’s a coincidence. In the London premiere of the same film, he turned up dressed as a swan with an attitude: spiked-up hair, silver makeup, and the infamous Harry Potter curse “Avada Kedavra” written on his palms. While he told the cameras that day he was dressed as a ‘fantastic beast’, it was giving us some Big-Bird-meets-Lady-Gaga vibes. His ability to take sartorial risks and turn it into a discourse for fashion is a breath of fresh air. Miller doesn’t just rock up in a well-tailored suit and call it a day. That’s too safe for him. He challenges the foundations of style and in the process encourages (and might we dare say influence) his followers to dress to their heart’s desire. We already can’t wait to see more of him in 2019.
Who could forget the moment when Billy Hargrove rolled up to Hawkins Middle School in his skin-tight jeans, denim jacket, outrageous mullet, and a Midwestern swagger in Stranger Things’ second season? The bad-boy heartthrob was played to perfection by the 24-year-old Australian Dacre Montgomery, who is currently shaping up to be one of 2019’s hottest actors. Montgomery recently wrapped the filming of the third season of Stranger Things, which is set to premiere next year. But he’s not letting this newfound fame get to his head, teasing in a GQ Australia interview that his fans would learn more about his upcoming projects in the coming months. While 2018 was undoubtedly Montgomery’s breakout year, 2019 will truly be his time to show the world all the talent he has to offer. Henry Golding at the Tom Ford front row. It’s a surreal moment whenever we see one of our own make it on the global stage. Henry Golding, better known as the suave Nicholas Young of Crazy Rich Asians had a stellar 2018. Not only did the movie where he played a leading role gross over S$300 million at the box office, but the cast was also recently nominated for Best Cast at the Screen Actors Guild Awards. Fun fact: Young was Golding’s first professional acting role, which makes his debut performance even more noteworthy. Since the overwhelming success of Crazy Rich Asians, the fame train following Golding has been chugging on at full speed. Director Paul Feig has tapped him for two collaborations: A Simple Favor (a thriller which was released in September 2018) and Last Christmas, which started production just last month. The British-Malaysian actor was also one of GQ’s three Men of the Year, and also their first Asian cover star. Score one for minority representation. Golding’s success as an Asian actor has been likened by many as a beacon for all the aspiring minority actors heading to their casting calls. In an era where diversity in Hollywood is the hottest topic, Golding (and the other Asians cast) gives us hope that soon, the #OscarsSoWhite chapter in an all-too-exclusive Academy will pass. 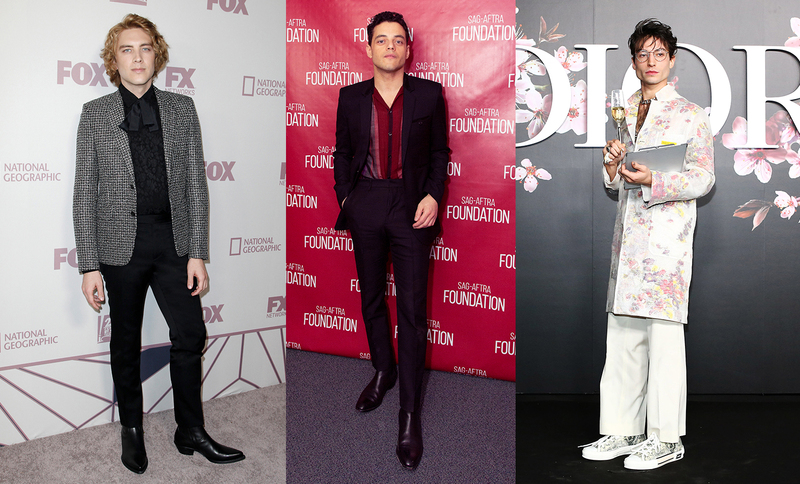 Cody Fern at FOX’s 2018 Emmy’s Nominee Party in Saint Laurent. Ryan Murphy’s horror television anthology American Horror Story has had its ups and downs, but one thing that can be counted upon is the stellar performance from the ensemble cast. In the latest season which just recently ended, we got a taste of fresh air by way of Cody Fern, who had a leading role as the antichrist Michael Langdon. While this wasn’t the first time Fern had with collaborated with Murphy—the duo also worked together on The Assassination of Gianni Versace: American Crime Story—it was only on Horror Story where Fern’s talents shone through. He was a true tour de force that drove the narrative in a highly compelling manner in every scene he’s in. His brooding, intense eyes only add more depth to his role as the prodigal son of Satan. With Horror Story already renewed for two more seasons, it’s safe to say that we’d be seeing more of Fern in the coming years. After all, Murphy did tease that he was “cooking up something good” for Fern and two of his regular stars Darren Criss and Finn Wittrock (both were also in Assassination). Almost a decade ago, the British comedy-drama Misfits premiered on television, effectively launching the careers of Iwan Rheon (who played the supervillain Ramsay Bolton on Game of Thrones) and Lauren Socha (who won a BAFTA for her work on the series) among others. One name that was also associated with the early days of Misfits was Robert Sheehan, who was replaced with another actor after the second season wrapped. Fast forward to the present, Sheehan is set to have a stellar year ahead. He recently starred in the post-apocalyptic epic Mortal Engines and plays a leading role in Netflix’s upcoming television series The Umbrella Academy, based on the book series of the same name. Sheehan plays Klaus Hargreeves, a telekinetic who has the ability to communicate with the dead. Alongside him are Tom Hopper, Ellen Page, David Castañeda, Aidan Hopper, and Mary J. Blige. If his performance in Misfits is anything to go off by, it would be a trip to watch Sheehan get back to his science-fiction roots in Umbrella Academy next year.